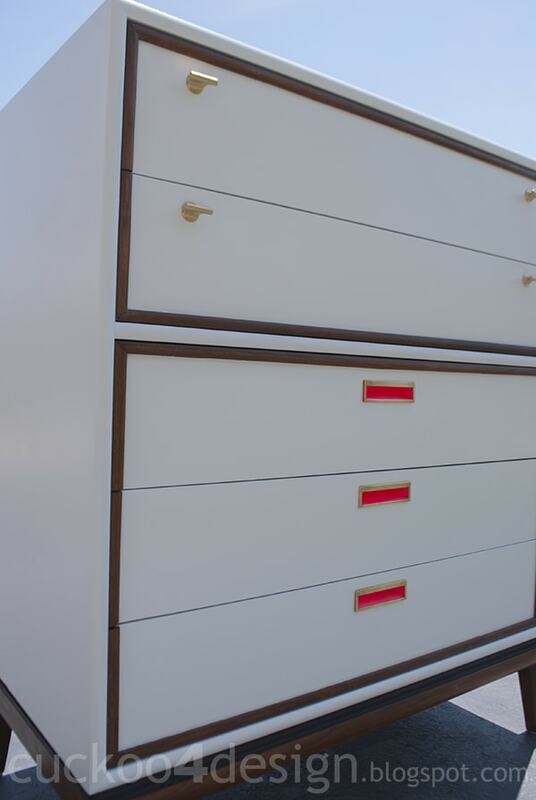 Hi friends, I’m so so excited about this furniture makeover today and I know that mid-century modern furniture isn’t everyone’s cup of tea but I have been searching for an opportunity to get my hands on an affordable dresser that I could redo and KEEP. 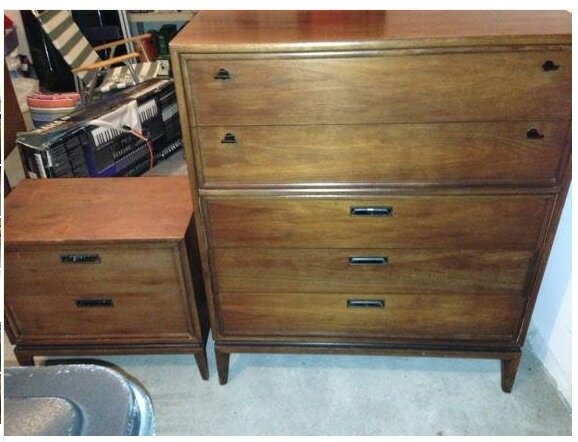 They were listed at $100 but the hubby talked them down to $70. YAY! I knew he could do it! You can’t see it in the photo but they weren’t in the best shape. Not bad but they needed work. The veneer was chipping in several places and there were scratches and dents everywhere. I know the wood tone is beautiful but I’m not a professional wood worker and you can’t tell by the photos but it needed work. You also know me and I was itching to paint it. I received a big compressor and paint guns for Christmas from my hubby and I was waiting for the weather to get warm so I could finally try it out in the garage. I hadn’t even opened the compressor box since Christmas. I patched the scratches, dents and chips. Lightly sanded the dresser. Wiped it with TSP and taped it where I wanted to paint it. Then I started with the owner’s manual. God I swear they make this difficult. And when I finally got to the compressor part I noticed that the owner’s manual and screws where missing. 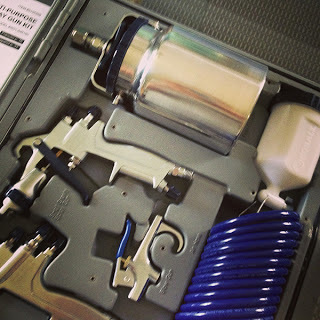 I also couldn’t hook up the paint gun hose to the compressor. So back I went to Lowes where I got my items. When I tried to hook everything up, my neighbor showed me that the compressor had previously been used and when he opened the pressure/air on the bottom, a huge amount of rusty water came out. GREAT isn’t it? I was so upset. I should have opened the box right at Christmas. This is so frustrating and I have no clue what to do. Anyways, I tried spraying with my smaller compressor which didn’t work out so well, so I went back to the good old regular paint method. 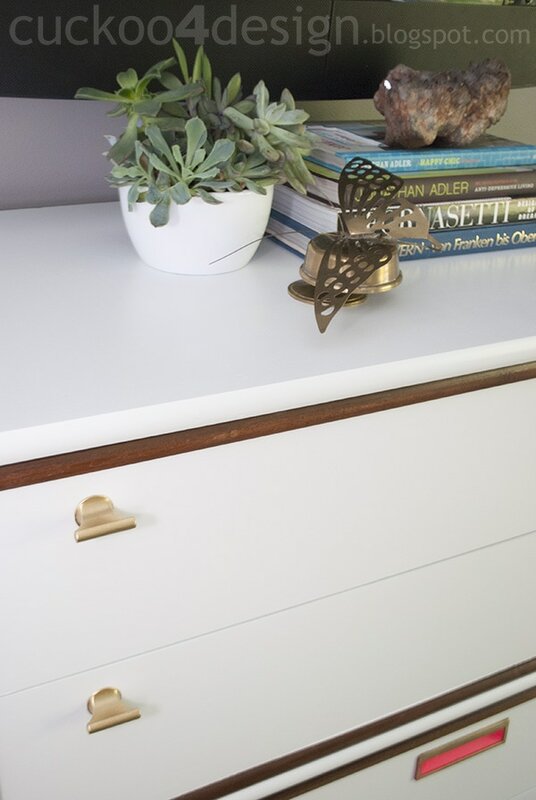 I started with Kilz spray primer (I don’t think I will ever use anything else) and then I ended up hand rolling the rest with my favorite white semi-gloss Rustoleum enamel. I wanted to Rub ‘N Buff the hardware since not all of it was brass but cheap metal but that didn’t work out so well either. So I spray painted the small knobs and painted the rest in a bright pink neon. Yeah baby!!! I did and I love it. With a simple small change I can change that detail if I want to. I was thinking of adding coral, emerald, mint or turquoise but then decided the neon. Enough talking, right? You want to see it! So what do you think. Do you like it? 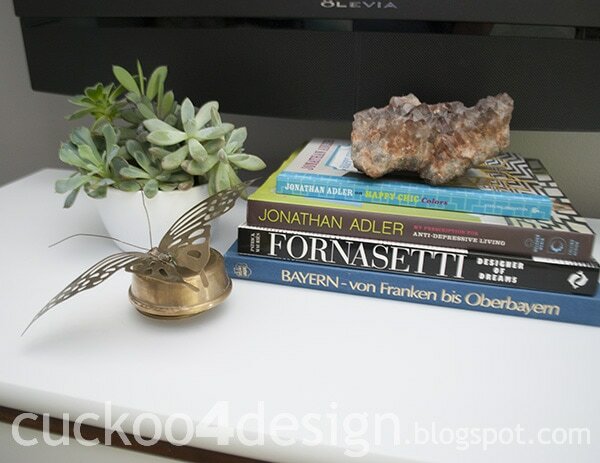 I still have the matching bedside table which my son wants to keep in his room (click HERE to see the makeover), so I will be painting it soon too. He likes this one and wants something similar but obviously not with pink. I wish you all a great weekend and “Happy Mother’s Day”. Talk to you on Monday! Love this! And how you left the wood trim. I never would have thought of that, but it makes the whole piece pop. I love it Julia!!! I love how you did it all white but left the outside trim of the drawers a stain color. Oh my! Love love love it! Plus, what a complete steal! Beautiful job, Julia! Leaving the bottom stained to give the impression of a base was genius! In general I am on the fence about painting wood furniture, but this is cool, cool, cool. My favorite part is the pop of color in the handle. Love it!!!! Ack! I love the neon pink with the gold (and the wood and the white…)! And who doesn’t love mid-century modern furniture…crazy peeps…that’s who! LOL, right…they are crazy for not liking midcentury modern furniture. Ummmm YES FREAKIN MA’AM. White…neon…gold…MCM..Julia you are speaking my furniture love language in a major way! I loooooooove it. I’ve been searching and searching for a MCM piece for my front room forever. I’m crossing my fingers that ill find one soon. I’m itching to do a two tone pair project, too. Great job lady. Oh and I would take the compressor back to Lowes. Thank you, Shavonda. I have been trying to get my hubby to return the thing. But of course he lost the receipt and never activated his Lowes car. Such a bummer. 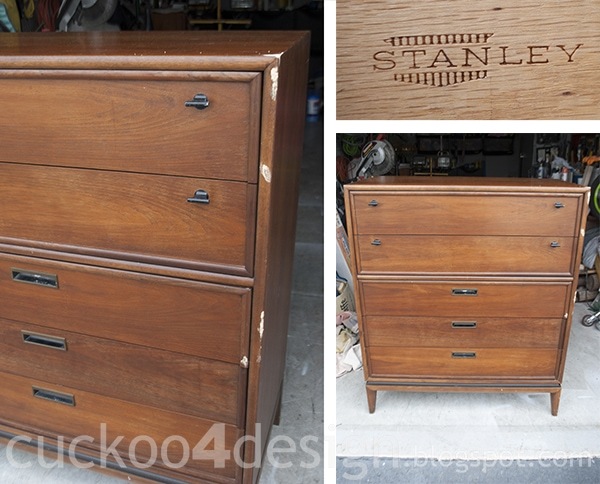 I hope you find your own MCM dresser because I sure would love to see what you’ll end up doing with it. Thanks so much for the kind words, I appreciate it so much! Awesome project Julia! We love to see something old become new again! We are happy to hear that you had success with KILZ spray primer and that you don’t think you will ever use anything else. If you ever have any questions about our products, please visit our Facebook page at facebook.com/KILZBrand. Also, we would love for you to share your experience with our products by writing a review. Here is the link to our review page: bddy.me/YQS31I. I’m so glad you stopped in and I did go over to your facebook page! Lovely! Great two tone and the gold/neon hardware is perfection. Great makeover!! Ooo me likey!! I love the gold and pink accents and that you kept the band of wood around it. Beautiful! So chic and you are sooooooooooo good! Thank you so much Patty, you are so sweet! Wow, it’s beautiful! You did such a great job! Thanks Ingrid! Are you going to post your side table? Can’t wait to see it. WOW! you totally knocked it out of the park, friend! LOVE it!!!! so chic! Thanks Kristin and Happy Momma’s Day! Thanks. Did it play “swan lake” like mine? I love this one! Beautiful work! Does your roller leave any sponge marks, it looks so smooth. love love love it, fabulous as always! have a great weekend! Holy smoly! Dang that looks great! I sure don’t have your vision. It is so gorgeous now. And I would have never taken a second look at it before you did your magic to it. Happy Mother’s Day To You & All. Wow! I wouldn’t have thought, that the original hardware would look so great – I usually take the other way and replace all knobs… maybe I should think about it again! 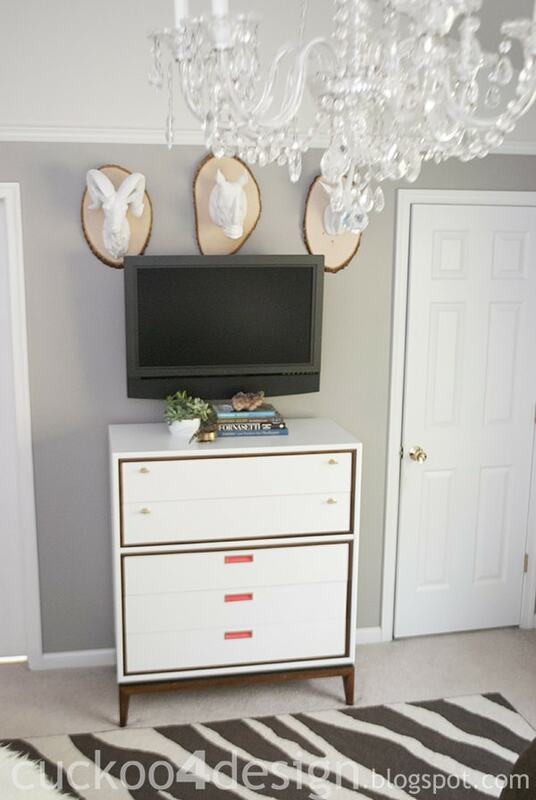 Mid century modern isn’t really my thing…however…I really love what you did with this! 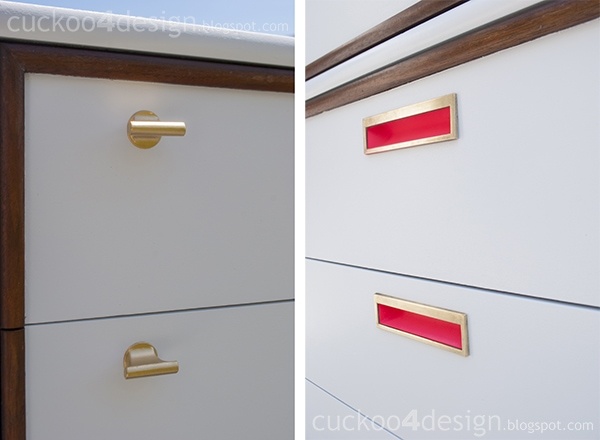 The combo of white and wood is really pretty and those gold knobs and red accents are great and really eye-catching. Nice work! Oh wow! Love it! I love where you chose to leave the wood. It looks perfect in its new home! 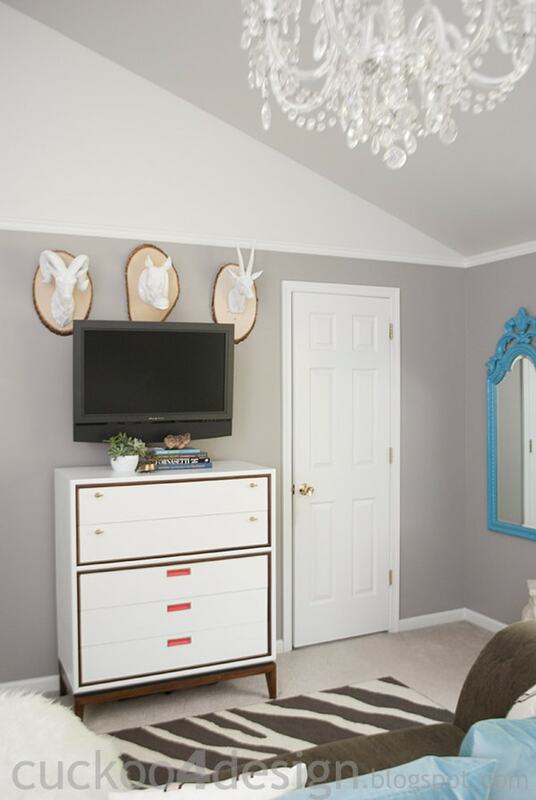 I am seriously in love with this dresser! Your color choices were spot on, Julia. (Crushing on the perfectly pink handles!) Such a fabulous piece! WoW!! I am always drawn to mid century furniture! You did an AMAZING job on this!! Thank you for sharing at Give Me The Goods! I wanted to stop in and let you know that you were my pick for features this week! Come by my blog and grab your button! Congrats!!! I’m playing catch up! Love what you did with these!! Julia, love the Stanley makeovers:). With respect to the nightstand, if you are using spray paint, how do you manage to isolate the tiny spots and blue trim for instance? Are you hand painting it? Thanks so much, I am new to your blog and if you have any other more in depth tutorials on how you arrived at the finished product, this would be of great help to me. Love your style, and your eye for a piece’s inevitable future is dynamite!!!! I am new to your blog (ok, to the blogging world in general) and I’ve read dozens of your posts in the past two days! I think you’re clever and creative and witty and cute. And TALENTED!! I love your style. All that to say, can you please help me? I love the grey walls in your pics and I’d love to know what they are. Choosing a grey, so I’ve heard, is so hard! And I haven’t even attempted it yet but need to. Aww thank you so much. Comments like yours make my day. Nice to meet you. The backwall in my kitchen is actually a silver by Ralph Lauren which they stopped selling at Home Depot. This is fabulous, just beautiful!! And looks great in your room–I love those heads! seriously, this is amazing! Just clicked over here from Apartment Therapy and am now excited to read your site. 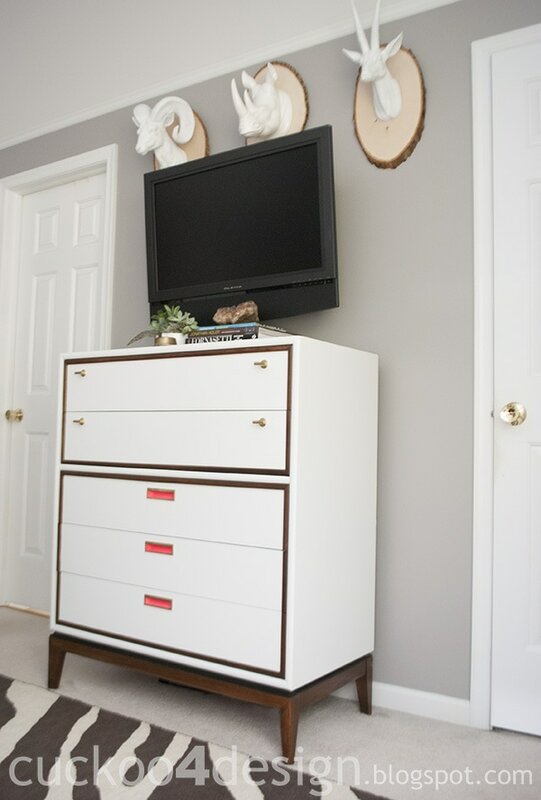 I’m dying to do this to a navy blue dresser we have in our entryway. Thanks for the sweet words and coming over to let me know. Some of the comments weren’t so nice on Apartment Therapy. I’m glad you like it!